Dr. Elizabeth Peeling was born and raised in Montreal, Canada. She received her doctorate degree in dental medicine from the University of Montreal. Dr Peeling began her career as a dentist in Australia before returning to Canada. 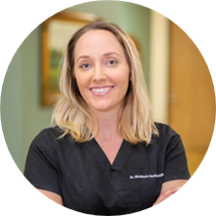 She has since worked in both private practice and with First Nations patients in the Arctic before settling down in Houston to join the outstanding team of dentists at Houstonian Dental. Dr Peeling strives to stay on the cutting edge of dentistry and has completed advanced training in dental surgery, endodontics, sleep dentistry, cosmetic dentistry and dental implants. She is a fellow of the International Congress of Oral Implantologists, as well as a member of the American Dental Association, Texas Dental Association and the Greater Houston Dental Society. She is committed to offering the best care to her patients, who appreciate her friendliness and gentle approach. Dr Peeling is a certified Invisalign and Lumineers provider. Dr Peeling is an avid traveler, runner and yogi. She enjoys cooking, pilates, kickboxing, and spending time outdoors, especially with her border collie.